A Youth Fishing Rodeo will be held from 9 a.m. to noon on Saturday, May 14 at Cohen Campbell Fish Hatchery at 2726 Fish Hatchery Road in West Columbia. This free event is for all youth 15 and younger. 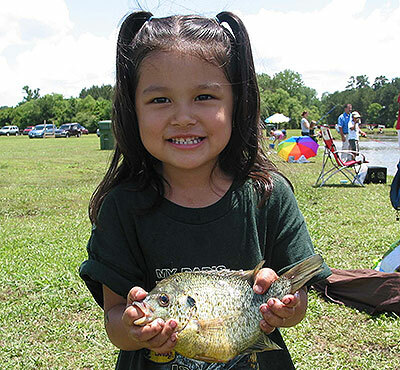 The West Columbia Youth Fishing Rodeo will mark the first time that the Hispanic community in Richland and Lexington counties has been invited. Onsite bilingual services, materials and giveaways will be provided by the S.C. Department of Natural Resources (DNR). The Youth Fishing Rodeo will be a bilingual event offering resources in both English and Spanish. This is a great opportunity for families to come together and enjoy a morning outdoors with a variety of prizes. Free refreshments will be provided at the Youth Fishing Rodeo. Some fishing rods will be available, but please bring your own fishing equipment if possible. Only youth may fish, and youth must be accompanied by parent or guardian. Bait will be provided. No pets will be allowed at the Youth Fishing Rodeo. Space will be available for 250 youth to fish. Preregistration is requested. Register online or via phone at (803) 737-8483. Register in Spanish The telephone number for Alix Pedraza, DNR's Hispanic outreach coordinator, is 803-734-9885. The West Columbia Youth Fishing Rodeo is sponsored by DNR and the Harry Hampton Memorial Wildlife Fund.